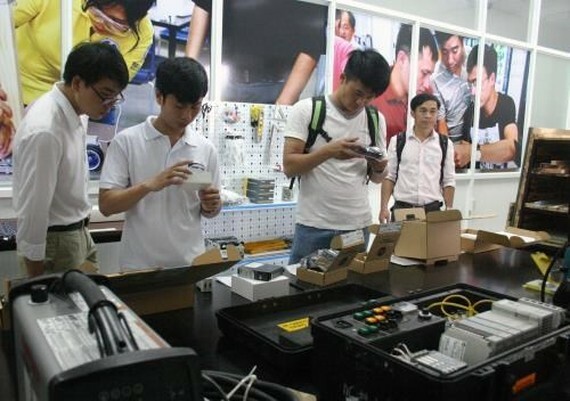 A maker renovation space was launched in Ho Chi Minh City on June 8 with the support of the Saigon High-Tech Park, the US Agency for International Development (USAID) and the US’s Arizona State University, aiming to assist the building of an innovation ecosystem in Vietnam. The space is part of a USAID-funded project to build an alliance between universities and businesses through technology renovation. The project targets the promotion of diverse relations among parties, including the Government, businesses and universities with a shared goal of associating the teaching of science, technology, engineering and mathematics in universities and businesses’ demand and capacity. The 200 square metre space is equipped with modern technology equipment serving research and renovation activities. It serves as a venue for lecturers to build teaching programs and conferences basing on projects supplied for students, thus contributing to developing renovation culture, career skills, creation and startup spirit. Le Hoai Quoc, head of the Management Board of the Saigon High-Tech Park, said over the past years, the park has attracted many domestic and foreign investors, creating a strong motivation for the development of high technology in Vietnam, while speeding up the introduction of new products. Meanwhile, US Ambassador to Vietnam Ted Osius said that he believes that the space will attract a large number of students and enterprises who are keen on technology research and investment, promoting students’ creation and contributing to the economic growth of Vietnam. He also stressed the important role of partnership among the Government, businesses and universities in developing an innovation ecosystem of enterprises.